10,000 of them. 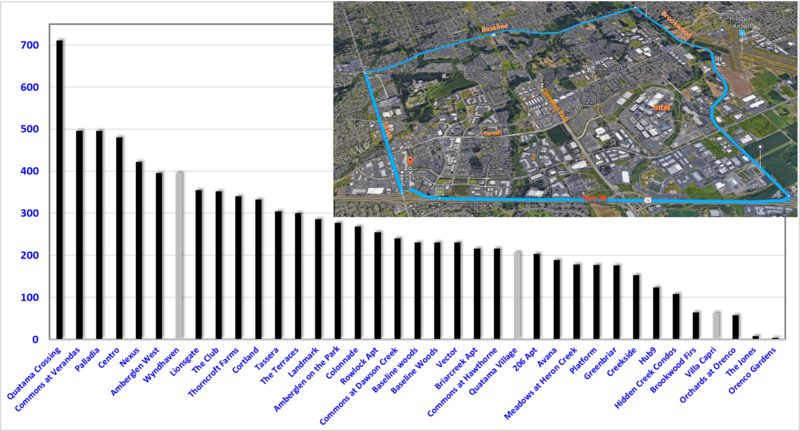 Rental units in 2×2 miles area of Silicon Forest Tech corridor in Hillsboro, Washington County (Portland Metro). (Click on image to enlarge). There is a rental housing boom in the Silicon Forest Tech corridor in Washington county, Portland Metro. At last count (July 2017), the number of rental units in 37 communities is approximately 9540. Inset map shows the area covered (by 185th St, Baseline St, Brookwood Pkwy & Hwy 26). The grayed out communities are designated for low-income housing. Source: www.apartments.com & individual rental websites. This high concentration of units is due to young workforce at Intel, Nike, Maxim, Qorvo, FEI, Solar World, Columbia Sportswear & other tech companies.